A study by author Krista Maywalt Aronson revealed that children who looked at picture books portraying children from different races together reported more interest in playing across difference. 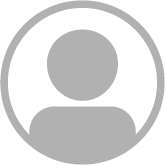 Demonstrate that everyone is included as an equal partner in the activities. Stories between adults and children or between children with unequal status, such as during segregation, aren’t as effective in stimulating vicarious contact. Emphasize that the kids are having fun together. Help students recognize what the characters have in common. Are they book lovers or dancers? Dinosaur or space enthusiasts? Basketball players or superheroes? Consider pointing out differences among the characters. However, racial and cultural differences, whether or not they are referred to in the text, don’t have to be emphasized in discussion in order for the books to be effective. Impress upon children that the characters are connected in a positive way. That "friends" is another group category that they both belong to. Imagine the impact of our libraries full of picture books about the joys of friendship among characters of different races. Now that there is research demonstrating how effective these stories are, let us work to get books like these into the hands of every child in America. Krista Maywalt Aronson, Ph.D. is a professor at Bates College in Lewiston, ME. Her research and teaching focus on the development of intercultural competence, or the ability to interact effectively across all types of difference, an increasingly important skill in the national and global marketplace. Anne Sibley O’Brien is the illustrator of the cross-group friendship book Jamaica’s Find (Houghton Mifflin, 1986) by Juanita Havill, along with 30 other multiracial books, of which she wrote 14. She blogs on race, culture and children’s books at Coloring Between the Lines and received the 2013 lifetime achievement Katahdin Award from the Maine Library Association. Good points in this article. We picture book writers and illustrators should conscientiously include cross-race interactions among our characters. I was happy to see that the illustrator for my latest picture book, THE NIGHT BEFORE MY BIRTHDAY (Grosset & Dunlap), included kids of different races attending the birthday party. I thought that was a positive message shown through Amy Wummer's art. Bravo, Amy! I am so happy to have this research proving what I already knew - that kids need to see picture books full of diverse characters - but I am surprised that you found less than a dozen pictures books like this...are you familiar with the children's book publisher Barefoot Books? Just about every picture book they create includes kids of all skin colors, shapes, sizes, physical abilities, etc. - they intentionally push their illustrators to do this, and the books are wonderful! This is a great topic and it confirms what I have always strongly believed to be true. Children are have an intense capability to absorb the completeness of a book far beyond what is written on the page. However, I do challenge this statement: "When we searched for picture books depicting positive interactions between two or more children of different races, we found fewer than a dozen titles. This would suggest that most American children have rarely or never seen a cross-race friendship depicted in a picture book." 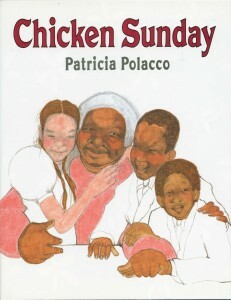 Independent publisher Barefoot Books (www.readingbarefoot.com) has published over 650 children's picture book titles and nearly all are either multi-racial or multi-cultural in content and/or art. Illustrations that depict and celebrate the population of the world is a foundation of their mission. There are many (though I agree not enough yet) children who are lucky enough to have these books in their homes & schools. Clearly we need to increase that number! The books are there - we need to get them in the hands of the kids (and adults who are reading to them!) - Thanks for bringing up such a great topic! I too would encourage you to explore the titles offered by Barefoot Books, they promote respect in all aspects of diversity. You'll note physical disabilities in illustrations such as a wheelchair bound girl in Animal Boogie, and many titles that will take youand your children into other cultures such as, Little Leap Forward (A boy's life in pre and Communist China), The Girl With A Brave Heart (a story from Tehran), The Wish Fool (fables from the Islamic world), We All Go On Safari (a story set in Tanzania), Barefoot's Books of Buddhist Tales, Indian Tales, Jewish Tales, African Tales and many more. Thanks, Liz, Laurie and Joni, for your comments and your recommendations of Barefoot Books. I did know about their books, and I checked the website again to make sure I wasn't missing any cross-group titles. Indeed you can see "kids of all skin colors," stories of children from varied cultures and countries around the world, etc. You can find this in the entire collection of beautiful books published by Lee & Low, and many individual titles in other publishers' catalogs as well. This is wonderful. 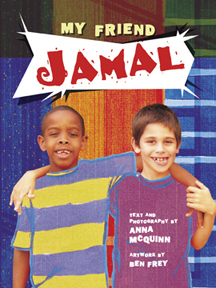 We need books like this that present positive images of diverse children. 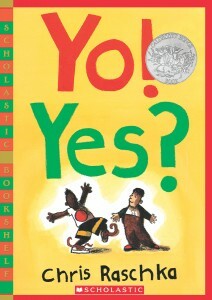 However, the cross-group books Krista and I are considering in this piece - the type of books on which the actual research was based - are not individual stories of children of color or in other cultures, or ones in which you can see a diverse group of children depicted in the illustrations. The ideal cross-group book shows a positive personal *relationship* between two or more individual children of different races and the activities and experiences they share. (See the examples cited in the article.) Despite our knowing how relatively few picture books there are featuring children of color, the absence of depictions of positive cross-race interactions came as a surprise to us. One of the purposes of this piece was to find titles we hadn't seen yet. We're eager to get recommendations of books showing friendship and fun between individual characters of different races, so please send them. Thanks for the response Anne, I see what you mean about the specific type of picture books you were looking for. Two Barefoot titles come to mind - Shopping with Dad features an interracial family (Dad is white, Mom is black, child is bi-racial and the book features Dad and daughter at the grocery store getting into all sorts of mischief but working together to solve a problem at the end) and Shrinking Same (Sam is a middle child who starts shrinking when he doesn't get enough attention from his family, until he shrinks so small he falls down the sink drain into the sewer system and meets a little girl named Izzy who has the same problem, she helps him find his way home - Sam is white and Izzy has brown skin). I look forward to other recommendations of books like this! Thanks, Sheila, for the request for the list of titles we identified - books that show children of different races sharing activities and having fun together. I just posted the list on my blog, with jackets: http://coloringbetween.blogspot.com/2014/05/cross-group-books.html Please add suggestions of other picture books, on the blog or here. Thanks, Liz. Interracial family books are soooo important, but they don't fit the category of cross-group books used in the research, which focused on peer-to-peer contact. As Krista writes above, "Stories between adults and children ... aren’t as effective in stimulating vicarious contact." In the second title, though there is cross-group contact, it seems to focus mostly on Sam and is about a problem the two solve together. When we looked deeply into it, it was amazing to see how few books feature friends of different races simply having fun together! I added a book to the list on your blog, Anne, but decided to put it here, too. It's called MOVING DAY by Leone Castell Anderson (Golden Books). There's a fascinating history of this book. Anyone interested can go to your blog where I went into this in detail. Thanks, Sheila. We're always happy to hear about more titles. This seems like such a simply concept, and it's surprising (even with the statistics we have on diversity) that so few books fit the bill. I guess it goes along with the idea that books about non-dominant cultures are a niche market - books about each race are just for the members of that race, so why would two kids who look different show up in the same picture book?... I hope we're on our way to fixing this sort of thing. A few that spring to mind just off the top of my head are EACH KINDNESS by Jackie Woodson, BLOCK PARTY TODAY! by Marilyn Singer, and ONE GREEN APPLE by Eve Bunting, but I know there must be many many more, and not just from one publisher. I'm concerned that some readers may be assuming that if you didn't find many picture books showing interracial friendships among children, that means you did find many picture books showing children interacting only with children of the same race. I'd be surprised if that were true. When I looked at my last five picture books, I realized all of them would be disqualified because they featured diverse groups of friends and neighbors that included both children and adults. When I looked at some of my favorite recent picture books, I saw friendships between a boy and a robot, a girl and a bear, a girl and a squash, and lots and lots and lots of books that don't include humans at all or have nothing to do with friendship. I'm guessing picture books that show children of any race playing together may be a smaller subset than we might expect. Oops! I followed a link tweeted today and didn't pay attention to how long ago this article had been posted. Sorry! Great article. My daughter is interested in talking about different cultures, and I love the celebration of friendship across groups. Recently read JUNA'S JAR by Jane Bahk, which depicts a sweet friendship between a Korean girl and a Latino boy. I think it'll be released in January.